These pages are the product of Brian Chandler's fevered imagination, except for the bits which are the product of the fevered imagination of other members of the Chandler family. And perhaps something else. Anyway, any opinions expressed are in general mine alone, and any errors are my responsibility. All rights, lefts, and centres are reserved. Naturally, I welcome any comments on anything you see here. See below for the wide range of feedback mechanisms available. I have made this material available on the Web. That means that the only way that you can possibly read it is by doing all of the things that writers of copyright conditions like to say you may not. In particular, you may (of course) copy this stuff (that's how it gets from the server to your browser), store it in an information retrieval system (it already has been), or modify it for use in your own ideas (that's how we got music, art, and mathematics, to mention just three). However, what you may not do is to take any part of it, and either misrepresent it as your own creation, or attempt to "lock" it up, by claiming copyright on it without the same liberal use policy. The mechanism to achieve this happy state of affairs has been dubbed "copyleft", and here's a relevant article from the Free Software Foundation: "What is copyleft?" Any derivative work is also freely available for use (i.e. is "copylefted"). You acknowledge the bits that I created wherever reasonably possible. You include a link back to this website wherever reasonably possible. If you do want to use anything in a non-free website, for example, please ask. It bears repeating that this "free", as in "Free Software Foundation", does not mean "costing nothing", it means "having liberty". So if you want to print bits of the Imaginatorium on postcards and sell them, go ahead (with of course the copyright statement, and mention of http://imaginatorium.org, or if it looks neater, www.imaginatorium.org). But once you've printed and sold the postcards anyone else will be free to copy them, under the same general conditions. One day I'll finish the essay ("Two freedoms") I started about the shortcomings of the "intellectual property rights" mindset, but in the meantime here's one that has already been rather well written by Eben Moglen: "Anarchism Triumphant: Free Software and the Death of Copyright." Gosh, I started writing "Aristotle, Plato, ..." and realised it's hopeless. I'm grateful to everyone who's ever helped me. In particular a couple of friends led the way, and enabled me to copy them (Norman "Green Gables" Havens and Peter Evans), but several other friends on the PandA mailing list also helped. I have tried to add links to the sources of all sorts of material where they occur, and the next section lists some of the software in particular that I have used. Un-American!! ... but I'm proud to say that Microsoft's operating systems chief Jim Allchin is reported by salon.com to have described the original software version of copyleft as un-American. I trust that includes me! View the heavily underused Imaginatorium Guestbook - or even make a comment yourself! 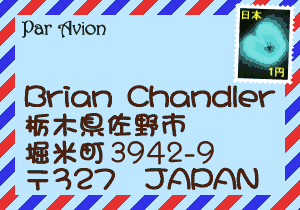 Snailmail - why not send me a picture postcard! Linking - as should be obvious by now, you do not in general need anyone's permission to link to their site, because a link is simply a way of telling other people where something is. But go ahead, anyway. Please spell "Imaginatorium" correctly, and feel free to use the following graphic buttons. If you want to link to the home page, then "http://imaginatorium.org/" is all you need. Otherwise, link anywhere you like, as long as it's sensible. Well, it's HTML, isn't it? I type it in with a text editor (NoteTab Std). More accurately, in the traditions of programming, I avoid typing anything from scratch, but copy the existing program that looks most amenable to bending into shape. Incredibly handy gadget for copying colours from one application to another as HTML codes, and checking what colour something really is when PSP is being coy. Asymetrix [spelling sic] 3D F/X - 3-D graphics: a copy came with my video card. Brian Chandler wanted to let you know about Reptile, an excellent texture generation program that's fun to use. It's available for downloading from Sausage Software's Web Site. It "grows" random textures which you can color in any way you choose. You can use these textures as a desktop decoration, a web page background, or anything else you can think of. And it's free! Since I can't personally draw anything, except a crude bicycle, I've found ArtToday (http://www.arttoday.com) very useful for snippets of artwork. The free service (you have to register) gives you a keyword search on a reasonably comprehensive set of (small) images, so for example I found a nice pipe (or not a pipe, according to Magritte) in no time at all. Ah, and the relentlessly reoccurring typeface? It's called "Brookhouse" and came on a CD-ROM of fonts with no discernable author. It's a copy of a design from the Bauhaus (Weimar, Dessau, and Berlin, 1919-1933). I like it!